The work of Hanel Photonics begins at the point, where on the market available laser systems come to their limits. Secure your advantage in competition as a scientist or product manager by the development of functional models that clearly set apart from the systems available on the market. It is not always possible to improve the parameters with reasonable effort. Therefore we work out risks and feasibility in the context of a project outline and possibly recommend an existing system on the market. Share with us your most important target specifications and Hanel Photonics will provide you a nonbinding quote with a free project outline. Hanel Photonics was founded in September 2012 and specializes in the development and production of laser systems. In close collaboration with established manufacturers of laser systems further development of existing systems is carried out. Hanel Photonics has expertise in the field of semiconductor technology, laser diodes, design engineering, testing and development of products for scientific and industrial applications. This know-how allows Hanel Photonics to offer all steps in the value chain, from optical design, construction and testing of laser diode components to implementation of complete laser systems. The existing know-how is particularly used in sales and distribution. HANEL Photonics is located in Berlin-Charlottenburg. 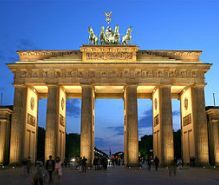 Close by are the Berlin University of Technology, Fraunhofer Heinrich Hertz Institute and Berlin University of the Arts as well as further well-known institutes of scientific research.